A trip to Ladakh had been on my plans for quite some time and finally this year, this plan took shape. 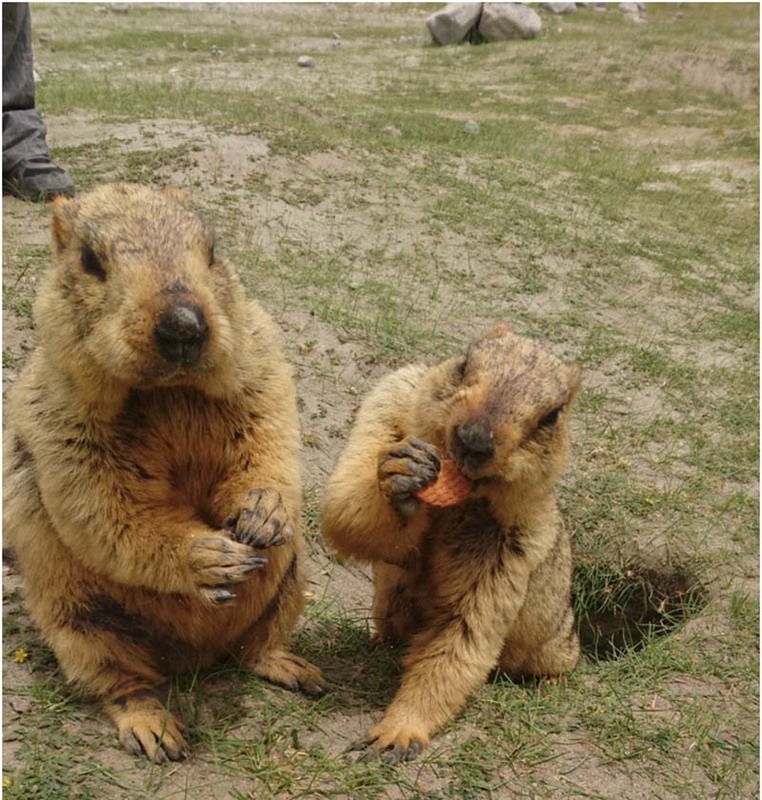 Below is an account of how our 9 days journey went; a brief Ladakh travelogue. Itinerary that we followed for the trip was as mentioned below. 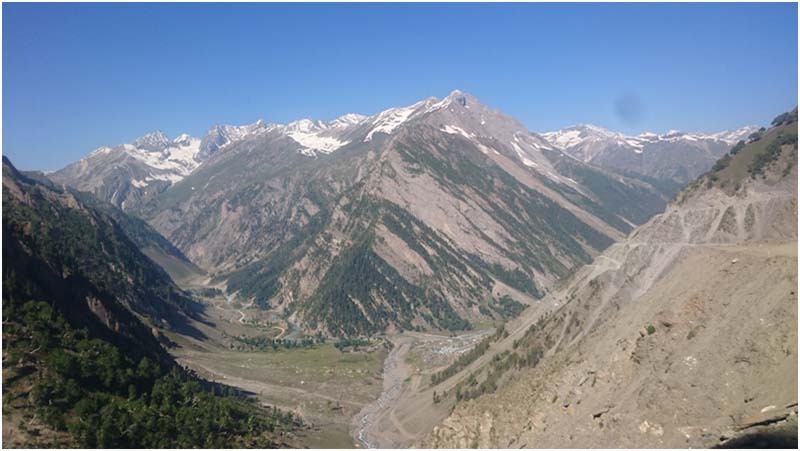 The trip above trip includes sightseeing of Srinagar, Gund, Sonamarg, Baltal, Zozila, Drass War memorial, Kargil, Lamayuru, Fotu La, Phey, Magnetic hill, Leh City, Shanti Stupa, Leh Palace, and Namgyal Monastery. After arriving at Jammu by train, we stayed at a hotel nearby called Le Roi. It was a good hotel and our stay was comfortable. If you want to stay at Jammu, I can recommend this place. We went to inquire at the bus stand near railway station for Srinagar bus. There weren’t any and we were told that there were no JKSRTC buses to Srinagar from that particular bus stand. For a bus from Jammu to Srinagar, we would either have to get it from Main Bus stand Jammu; or else go to a place called Raghunath temple somewhere near there. Buses from railway station only ply to inter city like Katra, Banihal etc. So we went to the General bus stand which was really crowded. After inquiring , we were told that during day, only shared cabs leave for Srinagar; fare of which would be around Rs. 700 to Rs. 1000 per person. Luxury buses always leave at night; making the entire travel to Srinagar a night journey for which you have to book your ticket with the private bus operators near the General bus stand. The JKSRTC buses for Srinagar usually leave in the first half of the day, in the morning. So on Day 3, early morning, we took those mini buses that leave from Jammu station to General bus stand, ticket of which is Rs. 20 per person. After reaching the bus stand, we inquired for Srinagar taxi and bargained to 750 per person. It was a Qualis cab. Someone came to us and said that we should go to Banihal Railway station and from there we could get a DMU to Srinagar for around Rs. 50 per person. Fare for shared taxi from Jammu to Banihal is around 400-500 per person. So now we had two choices. We could either pay Rs. 750 for a shared cab all the way to Srinagar. Or we could get a shared cab for Rs. 400 – Rs. 500 till Banihal Railway Station and from there board a train for Srinagar for Rs. 50 per person. I wasn’t sure whether Banihal train to Srinagar was operational. Because of all the unrest that takes place here in the valley, trains often get cancelled. Hence we decided to go all the way from Jammu to Srinagar in the shared cab itself. We started from Jammu at around 9 am. 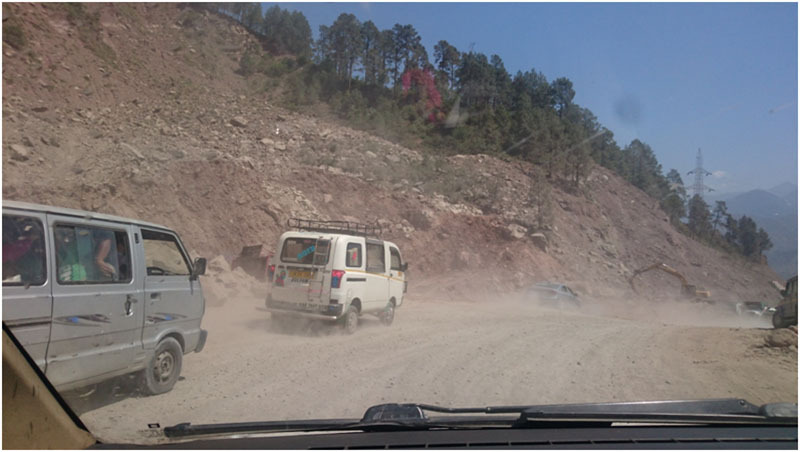 The Jammu – Srinagar highway was under construction for most of it, all the way till Srinagar. There was a lot of traffic from both side for which we had to wait nearly 2 hours. You will also find multiple army convoys on this route which will also cause delay in the journey. By the time we got to Srinagar, the clock was already showing 6 PM. We stayed at a hotel called “Hotel De apple”. It was not too far from TRC stand; and at about 10 to 15 minutes of walking distance from Dal gate. The hotel was decent enough and our stay here was comfortable. Both of the hotels (in Srinagar and Leh) I had booked in advance on MMT. Because roaming around searching for a hotel upon our arrival; with my dad accompanying me; would have been a hassle which I wanted to avoid. For our stay in Srinagar and the journey to Leh, I had already booked a taxi driver by the name of Noor Mohammed. Private taxis in Srinagar are a bit on the costlier side. Depending upon the number of travelers, the Dal Gate Taxi Union Rates can be starting from anywhere between Rs. 15k to Rs. 18k. Anyways, Noor was not available on the day of our arrival; so he sent his brother Murtuza to pick us up who charged us around Rs. 13k to 15k. For Day 3, we stayed at Srinagar and did some shopping. On Day 4, Murtuza sent another one of their brothers, Vidayat Ali, to pick us up from the hotel at around 5 AM. He was driving a Mahindra Xylo; and hence our journey to Leh started with small stops for sightseeing as per our itinerary. We traveled all day that day and arrived at Leh at around 7 PM. The entire city was crowded with tourists and I was surprised to see so many people here. For our stay at Leh too, I had already booked our a hotel in advance. It was Hotel Nezer View Guest House which was just about OK, nothing too great about it. It was around 15 to 20 minutes of a walk from Leh market. Some roads in the Leh were under construction and due to the sewage lines, it was a horrible smell in the air all around. The owner of the hotel informed us that the next day, 15th June, was going to be Eid; and the permit office will be closed; or open for just half a day. This kind of was a hitch in my plans as I wanted to go to Nubra valley on 15th. I thought of changing the plans then to get the permit on 15th in first half; but then getting shared cabs at last minute too was going to be a problem. So the hotel owner actually arranged the permits for us. We paid Rs. 1400 for 2 people for 3 days ( I guess their commission was also included). Budget trip to Ladakh now a days is really not that great an option. The hotel owner himself arranged a private taxi for us for Nubra on 16th, Pangong on 17th and then back to Leh. Amount was paid for this 3 days trip was Rs. 9600 + 9500 + 3000. We really had not many options and agreed on the same. So next day on 15th , we roamed around in Leh market and went to see the permit office. There were hardly any people there and the office too was closed. People there said that it will open by 10 AM; but I didn’t bother since we had already paid Rs. 1400 to the hotel guy for the permits. Then we inquired at taxi stand for shared taxis. 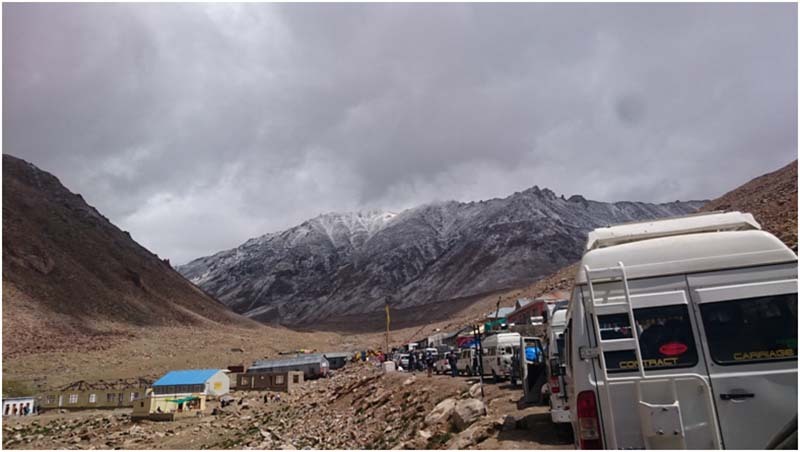 The drivers said that to go to any agency like K2 travel agency; if you want to travel in Ladakh on sharing basis. Private taxis are always ready to go on sharing basis since there are more tourists coming in and less taxis. Another choice is to go to the bus stand for any tempo travelers. I on the other hand wanted to see the best view, so we didn’t like the idea of sharing and paid that above mentioned huge amount for private taxi. Then I asked the hotel owner to arrange Activa for me for Leh sightseeing. It cost me Rs. 800 for a day; till 8 pm to be precise. I used it to go to Leh Palace, Shanti stupa & Namgyal Monastery; and little roaming around the market. Then I saw that the permit office was closed with no people around at 2 afternoon. Then I understood that most people go via agent for permits. So on 16th it was Eid and we left for Khardung La at 9.30 AM; reached at around 11.30 at the top of the peak. I was shocked to see how crowded it there was. There were people, cabs and tempo travelers all around; so much that even finding a place to park proved to be a tough task. We waited nearly 15 mins up there. 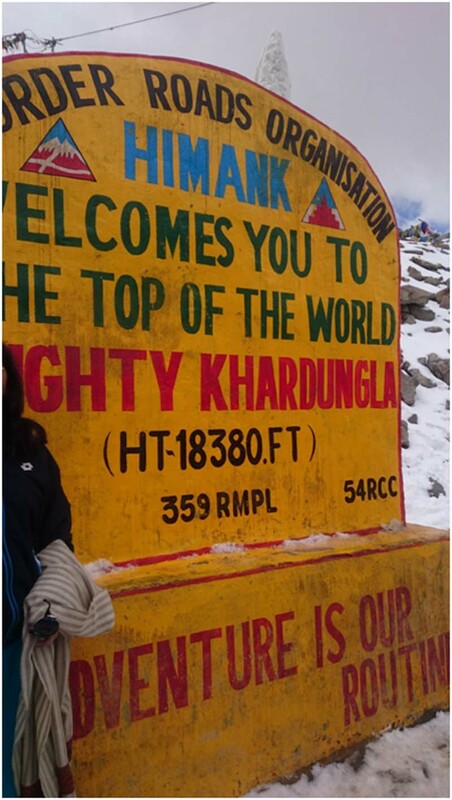 Many people and bikers were even arguing in order to click photos in front of that huge Khardung La board. I myself just clicked one quick selfie; and moved away from there. To be honest I was more excited to see all that snow all around. My dad was feeling a little short so he was inhaling camphor. It was OK though, just a little discomfort; no major or minor health issue. The key is to sit at one place and rest until you are feeling better. We waited there for about 15 minutes and started on our way to Nubra valley. 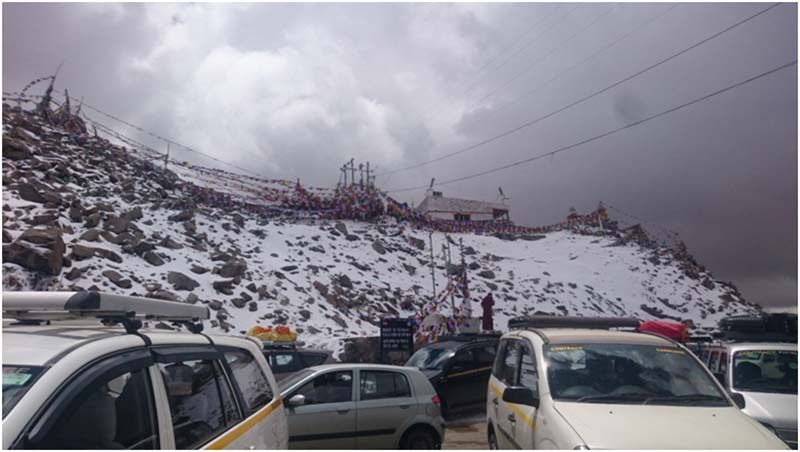 From Khardung La, we continued driving all the way to Diskit Monastery and reached there at around 1 PM. We had a quick lunch there at one of the hotels and left for Hunder. The Driver took us to a guest house by the name of Habib guest house at 4 pm. This guest house was good. 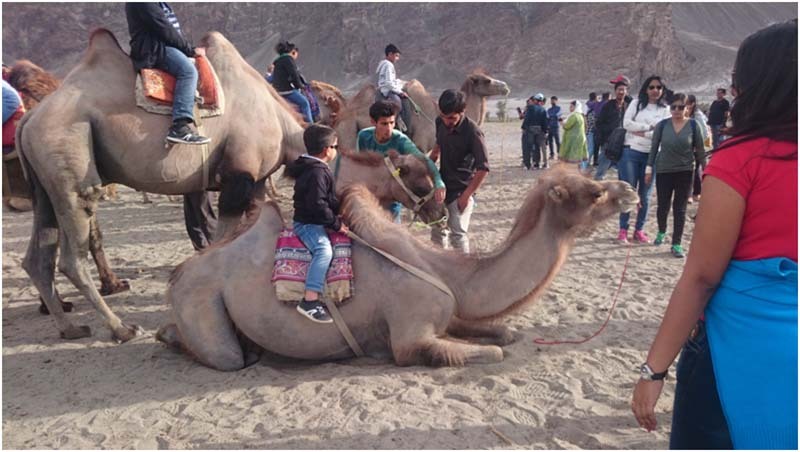 We freshened up and at around 5.30 – 6.00 PM left for sand dunes; and to see the double hump camel rides. I didn’t take the ride though but they were asking for Rs. 200 – 300 – 500 depending on how long you were riding the camel. Even this area for camel safari was so crowded. So many tourists with so many children. After roaming around for an hour, we left for our hotel. We spent one night there at the guest house.His daily fare was inclusive of buffet style dinner and breakfast. After having our dinner, it was time to call it a day and rest. Next day we left for Pangong Lake at 7.15 AM via Shyok road. It did not take too long and we arrived at the lake between 12.30 noon to 1 PM. This was again a crowded place. We took some pictures, spent some time by the lake; and in another 30 minutes, started for our way back to Leh city. At the shooting point at Pangong, there are only restaurants and less home stays. Those who want to do night stay should go further 10 kilometers to Spangmik. If you want an even quieter place then further 10 kilometers is Marek which would be ideal; away from the crowd at shooting point. Even for clicking a photo with this Yak, they were asking for money. If you want to click a photo with the so called “Kareena Scooter”, you will have to pay Rs. 50 to Rs. 100. If the ladies wanted to put on the Saree for the picture, there was an additional charge for that also. We never had lunch here at Pangong Lake because the driver said it would be expensive. So we left for Leh and somewhere in between, there was a point of many mini dhabas and restros; so we had lunch there (Dhabhas are cheaper than restaurants). We crossed the Changla pass and there were few nomadic people houses along the way. I brought that Yak butter from them. They asked for Rs. 1000 per kg so I bought a little for Rs. 200. We reached back at our hotels in Leh at around 5.30 – 6 PM and rested for the entire evening. Next day, we had saved for some shopping. We brought Army T-shirt caps and a pant, some bags and accessories, so full day was spent in shopping only. Last day, we left for Leh airport early morning by 4.15 AM. It was a good thing that we told the hotel owners to arrange for us our airport cab. There was a little hassle to leave at 4 am because the hotel staff was still sleeping. At last their room boy got up, and helped us. The cab was waiting outside the hotel. The Leh airport opens for passengers at 5. We reached early and sat outside the airport. Even at that early hour there were many people waiting out there. And then we boarded our flight home thus marking an end to our trip to Leh Ladakh. If you are a family with children and also if you are on tight schedule, budget trip & sharing rarely works, because it becomes difficult to find a taxi & sharing persons in peak season. I have also seen big families booking their own private tempo travelers. For small families, a cab is OK, we had got Innova just for 2 of us. Our driver was telling us that sharing hardly works because conflict of interest takes place among the passengers; and the driver stops according to his main points. He will not stop for sightseeing wherever or whenever you wished him to. For us, we had hired private, so the driver was in our control. I used to keep telling him to stop many places to click pictures and also for natures call. He was cool and this was actually the first thing that I told him about, that I will be asking him to stop often during the trip. I have never seen private mini buses plying on these sight seeing routes, majority are these Leh Ladakh taxis & tempo travelers. When it comes to hotel booking, it is advisable to book in advance through package or online portals if you are with a family. If you are in a small group of friends of girls & boys on bike, then it becomes easy to look for hotels and research around by your own after you reach Leh. But as of now, expenses & tariffs are increased over the year and living expenses for lunch & dinner in Leh city is increased. eg tea is 15-20-25. Per day proper meal for 2 people will at least be around Rs. 1000 along with water bottles as water refilling points were closed in some places. Diskit & Hunder, are remote places and hotels & guest houses are far away from each other. Same thing again, book in advance if you are with family. If you are in a small group of friends of girls & boys on bike, then it becomes easy to look for hotels and research around by your own. I was with my dad, so I wouldn’t have managed so much. 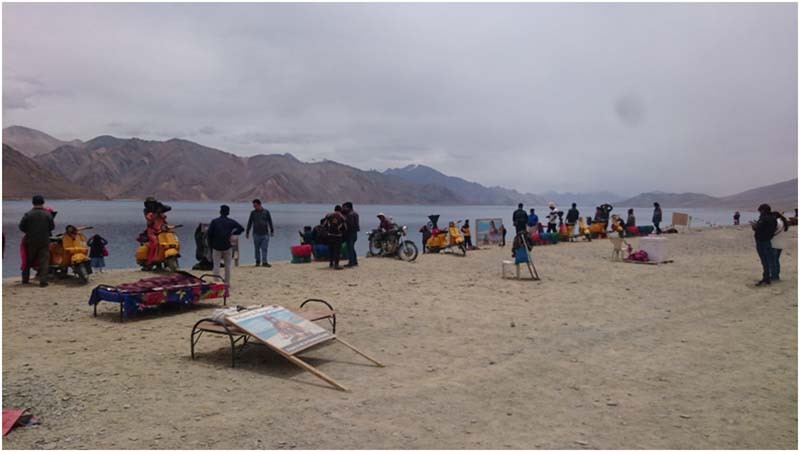 Even the drivers also have contacts about hotels in Diskit, Hunder, Pangong lake. I don’t know about the prices, generally it won’t be less than 1500 per person. Ok. Main thing is Srinagar to Leh. Below are a couple of contacts that you can rent a cab with. People going should contact them well in advance. They will definitely arrange cabs and drivers; but please don’t ditch them. They trust people calling & booking them. They have Leh registered taxis & they won’t be around TRC taxi stands in Srinagar. Noor Mohammed – 9419890787 – call him first, you can also take my name Jacob. Vidyat Ali– 9622406977. They also take sharing, but you have to inform them 2-3 days before, that you are looking for sharing cabs. 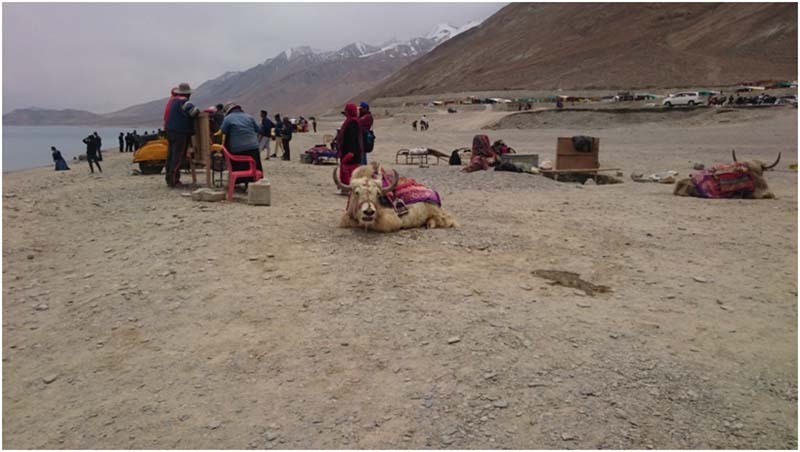 You’ll get stuffed in the cab & they will have minimum halts all the way to Leh for around 2000-4000 approx per person. Last thing is please inform every bikers of Ladakh to ride slow and properly, I had witnessed 1 accident of a bullet & Jeep. It was a horrible accident. Bike’s front tyre and guard was totaling gone. It was a rented bike from Leh. They had to call up the pick up van to carry the bike to Leh for which Rs. 9000 was the charge. Those rental company owners told these people to go to any Enfield showroom and get the bike repaired by themselves. 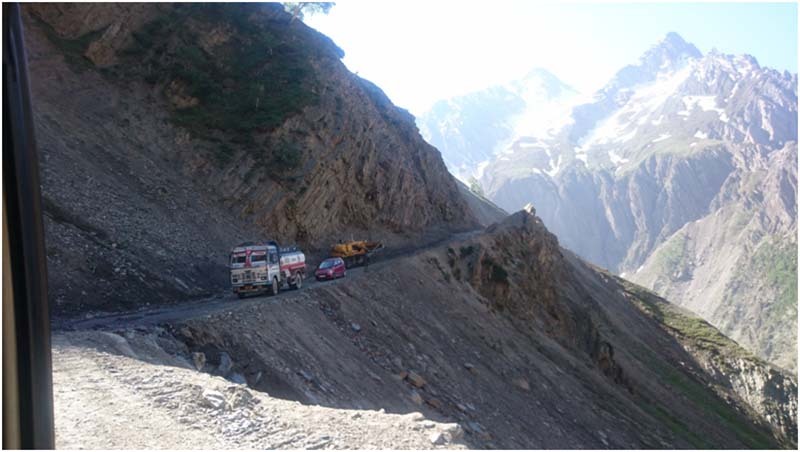 This Accident was on the way from Pangong to Leh. There were smaller accidents as well, of cars & bikes touching and scratching each other. Many people depend on Maps, Maps will not show you proper timings of roads and passes. There were people going towards Pangong via Chang La Pass at 4 -5 in the evening. The probably would have not made it to the lake before nightfall. Night Riding and driving is not advisable in Ladakh. One day Pangong trip and back to Leh is possible. One day Nubra valley trip till Hunder and back to Leh however would become a hectic schedule. Ladakh trip must be properly planned with the number of people in advance, if group of friends, then sharing of expenses becomes cheap and you as a group can hire 1 private taxi. There are solo travelers who book private taxi also and they are the only person in the cab. I guess I only messed up at the permit part, I would have saved 300-400. I hope the Ladakh travelogue above and information provided was of help. If you have any further questions, you may comment and ask below; or in the post at our Community Forum; and I will be glad to answer. Jack is a Simple Guy from Mumbai suburbs, originally from Goa, who likes to travel occasionally. But whenever he gets a chance to travel, he makes the very best out of it. He calls himself a vivid traveler who loves to explore new places. 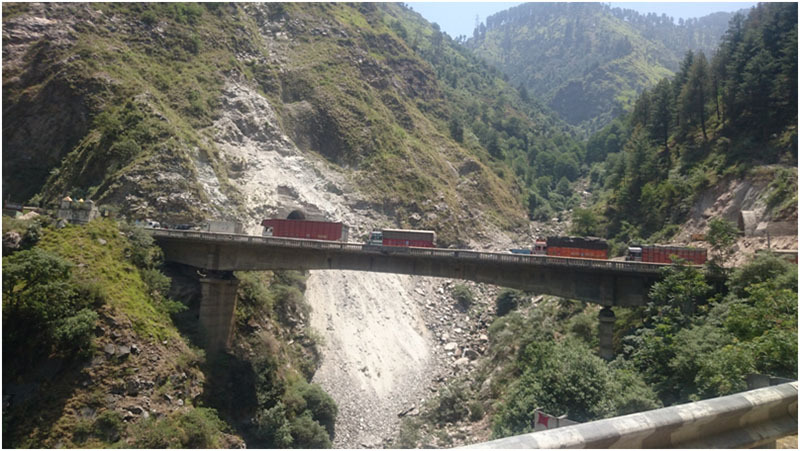 As a Kashmiri i would not recommend from JAMMU- BANIHAL… BECAUSE THE TRAIN SERVICE COULD BE SUSPENDED ANYTIME BECAUSE OF THE ENCOUNTERS TAKING PLACE IN SOUTH KASHMIR ALMOST EVERY 2ND OR 3RD DAY……SO BOOKING CAB FROM JAMMU- SRINAGAR WILL BE THE BEST IN MY OPINION……REST IS UPON U PEOPLE.. Thank you for adding this important piece of information Danish Bhai. I appreciate it.